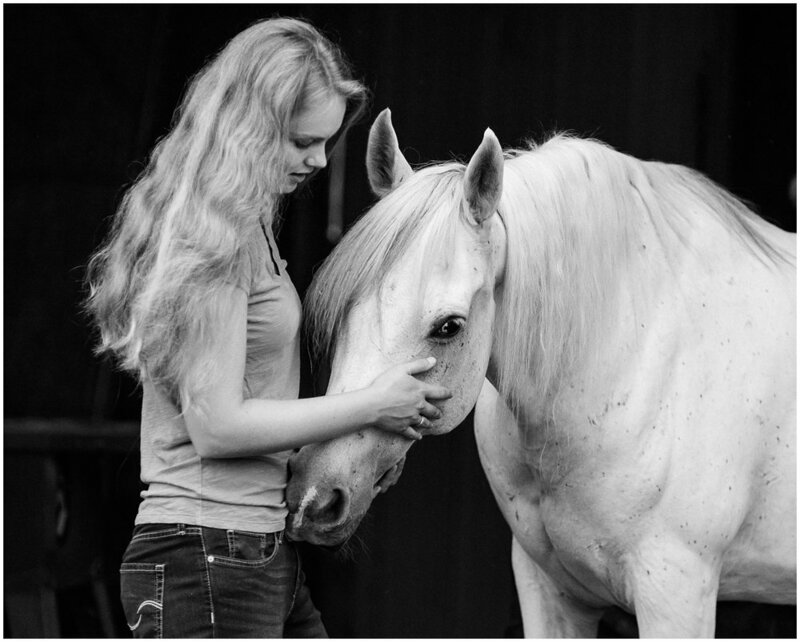 Kassie stroked and straightened Billy’s forelock while the gelding's big, curious eyes peered out at the misting rain falling just outside the barn door. I usually luck out when it comes to weather and portrait sessions—like when the radars indicated just a 5% chance of rain for the morning in the midst of a stormy week. But this time, that 5% decided to fall just a few minutes after we’d started to shoot. So, there we waited—two girls, one horse and one dog—all squeezed in front of the John Deere and riding mower in the shallow mouth of the barn. Gloomy clouds and drizzle aren't exactly the picture-perfect start to any day, but I kept my camera with me … you never know what you might capture if you’re ready for it, after all. Sweet Billy came to Kassie from the Indiana Horse Rescue during her time as a 4-Her; I'm not sure why anyone would give him up, though, because he soon flourished into a plump, happy, fluster-proof mount capable of everything from barrels to driving to parades and more; memories of my own summers are colored with supercuts of Kassie on Billy jogging alongside in Drill Team formation. Meteoric work success and life projects have kept Kassie from riding much these days, but she cleared time in her busy schedule to spend the morning snuggling with her personable partner. Little Abe is also rescue. His behavioral issues made it hard for him to find a home, but Kassie’s poured the love and work into helping this sweet pup transform into a shining example of a rescue dog's potential. He wasn’t too sure about getting so much attention, but he sure looks handsome in his portraits! The farmhouse, too, isn't unlike the rescues who now call it home. It was in dire straits while on the market, but with the help of her partner, family and friends, Kassie’s transforming the home from the inside out. (Sidenote: I don’t have any pictures of the interior, but, you guys…she’s building an overhead bookcase with a rolling library ladder. #DreamHome? YES.) She definitely has a knack for polishing all kinds of diamonds in the rough. While we waited for the clouds to part, I balanced myself on the wobbling riding mower, lifted my camera and pressed the shutter. We caught some more traditional "family" poses of the trio once the rain cleared up, but those moments in the doorway as the rain fell down—not a conventionally perfect setting but beautiful nonetheless—might be my favorites from this entire session. 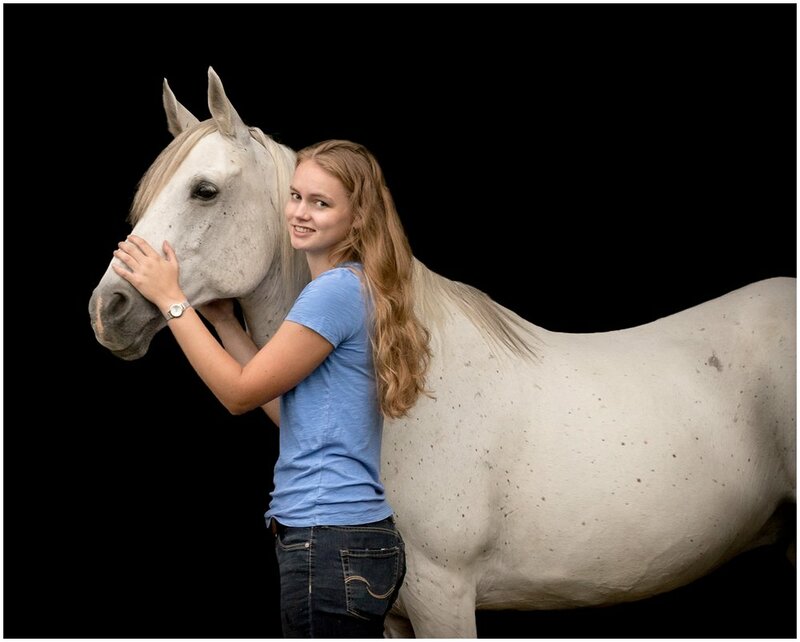 Ready to start planning your own session with your equine partner? Contact me to get started! Located in Indiana? Reach out to learn more about my plans for future trips to the state.